Directions: From I-19 in Arizona, take exit 29. Go north on the frontage road, which is on the east side of the highway. Turn right into the parking lot. One of Arizona’s treasures is Tumacacori National Historical Park. Located in the park is Mission San Jose de Tumacacori, the oldest Spanish mission in southern Arizona. You can walk inside the ruins of the Franciscan church, and there is a very nice courtyard garden along with a heritage orchard. Beginning in late February and lasting through mid-March, the grounds are covered in wildflowers. 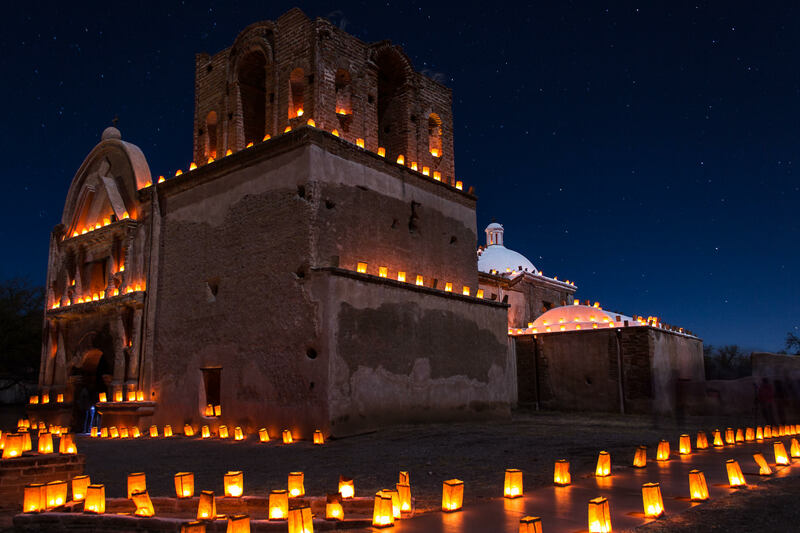 Another good time to visit Tumacacori National Historical Park is on Christmas Eve when volunteers line the paths and walls with thousands of luminarias. For this shot, I used a wide angle lens and a tripod so I could keep my ISO low and use a long shutter speed. If you visit during the day, keep in mind that the park normally closes at 5:00, so bring a circular polarizer to cut down on the mid-day glare.